Home Google I Love Canada! I never thought I would say (write) that, but it’s true. I LOVE Canada. Well, maybe not Canada or Canadians per se. I don’t have anything against Canadians of course, but that’s not really the point. Ok, so what IS the point? Well, after some diligent analytics and analysis, I noticed that Elliot’s Blog is the #1 result of 29 MILLION+ results for the term domain blog. 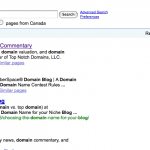 Now I am not that full of myself to think that I have the BEST domain blog, but at least in Canada, for today, I am #1! There’s a reason why your blog is #1 here. It’s awesome. Keep up the good work! Is this where I say, as a proud Canadian, “you’re welcome”? Elliot of course Canada & Canadians love the Best Blog online! Informational, Educational and in Layman terms. Top notch lap dances, interesting looking money, strong beer AND great google results….what a country! … here’s hoping your well-deserved #1 ranking causes a flock or two of our golden Canadian ‘click’ Loonies to fly your way!